Time for the Big Fat Quiz of the Year. The years in question being 1979/80. Your genial quiz master is Roy Race, master of all Melchester. 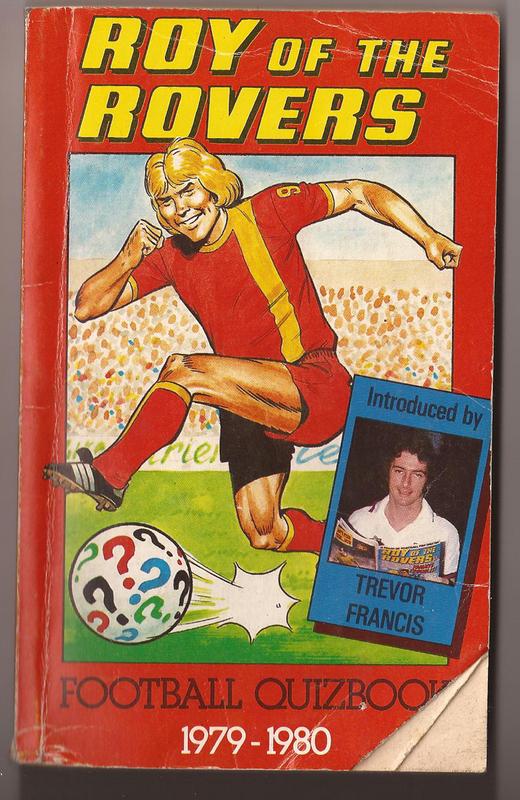 “Looking through the questions [in this book], I can see that anyone getting a high proportion of correct answers can rightly claim to be a football expert. I’m certain that when my fellow professionals buy a copy of this quiz book, they’ll spend many hours puzzling over the questions. We’re always in need of something to pass the time when we’re travelling to away matches...and this book is just the thing! 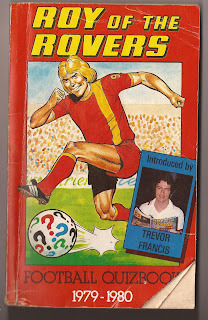 “You’ll find the answers at the back of the book...but no cheating, that’s not the way Roy of the Rovers does things! 1. Which club has Ayresome Park for it’s home ground? 2. Which club has won the First Division title more often, Derby County or Chelsea? 3. Which club once played at The Nest? 4. Did Bill Shankly ever play for Scotland? 5. Scotland had two points deducted from their total in Group 4 of the 1978 World Cup. Why? 6. When did Wales last win the Home International championship outright? 7. What year did Pat Jennings make his debut for Northern Ireland? 8. Three players from Nottingham Forest were in the Scotland [World Cup] squad. Who were they? 9. What is Kevin Keegan’s nickname in Hamburg? 10. Cyril Knowles played for England. True or false? 11. Who was the manager who quit football to become an evangelist in America? 12. Which club can hold more fans, Liverpool or Manchester United? 13. When were shinguards first used? 14. Which was the West Country team that once went 58 matches without using a substitute? 15. Chelsea’s record signing David Hay cost £225,000 when he joined them from Celtic in which year? 3. Norwich City used to play at The Nest. An absolutely remarkable ground. i.e. "Its most noticeable feature was a large concrete wall at one end of the ground, which supported a cliff on which supporters would watch the matches."